Research focusing on microalgae is currently experiencing a renaissance due to the potential of microalgae for providing biofuels without competing with food crops. Despite this potential, our knowledge of neutral and membrane lipid metabolism in microalgae is very limited, and opportunities to explore lipid metabolism in microalgae and contrast it to plant lipid metabolism abound. The unicellular green alga Chlamydomonas reinhardtii is currently the best genetic and genomic model for microalgal lipid research. 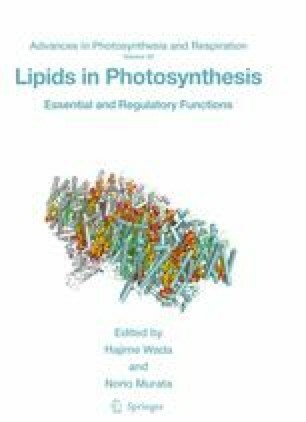 This chapter summarizes the current knowledge of lipid metabolism in this alga. Chlamydomonas lipid metabolism differs in some aspects from that of seed plants. For example, Chlamydomonas lacks phosphatidylcholine and has in its place the betaine lipid diacylglyceryl-N,N,N-trimethylhomoserine. This has important implications for lipid trafficking and lipid modification. These distinct aspects of algal lipid metabolism combined with the lower number of genes involved in lipid metabolism in Chlamydomonas provide several opportunities for basic research aimed at a more in-depth understanding of lipid metabolism in eukaryotic photosynthetic organisms in general. Work on lipid biosynthesis in plants and algae in the Benning lab is currently supported, in part, by grants from the US Air Force Office of Scientific Research, the US National Science Foundation, the US Department of Energy, the Great Lakes Bioenergy Research Center, BASF-Plant Sciences, the MSU Center of Excellence for the Structural Biology Membrane Proteins, and the Michigan Agricultural Experiment Station.